The 2015 Blue Jays were an offensive juggernaut. As fans, we got used to seeing multiple home runs in a night, and as a result we grew to expect it. The Jays scored more runs than any team in baseball and it wasn’t even close. Offensively, the club was gifted, and it became a pillar for which the team leaned on. That’s what makes the start of the 2016 season so hard to fathom. The Blue Jays have been mediocre; they have the 18th fewest hits, the 10th lowest batting average and the 12th lowest on-base percentage. So far, Toronto ranks in the middle of the pack for runs scored and doubles, while hitting slightly more home runs than the average team. The club does rank first in one category however, strikeouts…and it’s not particularly close. The Jays have now struck out 141 times over the first 14 games, which puts them on pace for 1631 on the season. I know that the season is young and it is far too early to draw meaningful conclusions, but we can look at the trends that have appeared and theorize if they are likely to continue. We can also question why some things are different than last year. For me, and I’m sure that I’m not alone, the glaring difference between last year’s club and this year’s, is the strikeout rate. This year the Jays have struck out almost 29% of the time; last year that same number was only 18.5%. One of the most compelling arguments for the Jays offense in 2015 was that they hit an astronomical amount of home runs, but with a low strikeout rate. The offense put the ball in-play and hit for power. So, why are the strikeouts coming in heaps and bounds this year? 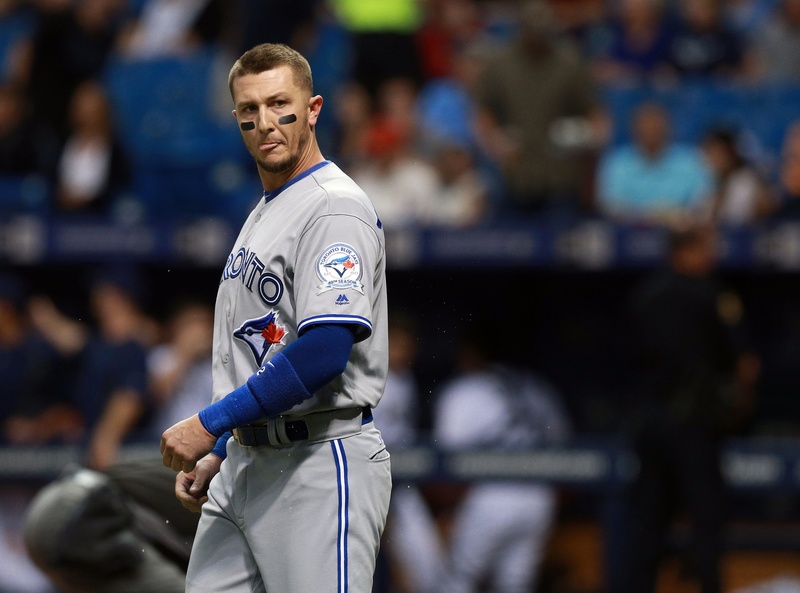 Are the Jays swinging at a lot of pitches out of the zone? Has the team had a lot of called strikes against us? Lucky for us, FanGraphs tracks some of these metrics. O-Swing% tracks how many pitches are swung at outside of the zone, Z-Swing% measures how many pitches are swung at inside the zone, and Swing% combines the two. As you can see, the team is swinging at nearly the same rate of pitches as last season. To give you some perspective, in 2015 the median O-Swing% was 31.1%. The Jays swung at less pitches outside the zone than the average MLB team. Nothing has changed this year. It is not as if the team is swinging at a bunch of sliders down in the dirt. The same can be said for pitches in the strike zone. Over the first 14 games of the season, the Jays have swung at pitches in the zone 64.1% of the time, on par with 2015. Again, for perspective, the median rate for swinging at pitches in the zone was 67.1% last season. The Jays are more selective than most teams when it comes to swinging at pitches in the strike zone. This is a fine approach; the hitters are looking for pitches that they know they can hit well. For example, Bautista will routinely take an off-speed pitch early in the count for a strike, while he waits for the pitcher to throw him a fastball on the inside part of the plate. The overall swing rate is very similar to last season. As a result, the club’s plate discipline does not seem to be the problem. Let’s look at the team’s contact rates. O-Contact% measures the % of the time that the hitter makes contact with a pitch outside of the zone, when he swings at a pitch outside of the zone. Z-Contact% means the same for pitches within the strike zone. Here we start to see major disparities between last year and the beginning of this season. The Jays are failing to make contact more than last season on both pitches in and out of the strike zone. These are sharp declines, especially knowing that the offense isn’t changing their swing patterns. If the team was only swinging at more pitches outside of the zone, then that would provide a possible explanation for why they are missing so much more…but they aren’t doing that. The Jays’ inability to make contact with the ball inside or outside of the strike zone is directly inflating their strikeout rate. It’s possible that this is not the only cause of a higher strikeout rate, and that the club has seen more called strikes than in previous years. Buck and Pat have mentioned numerous times that the umpires made it their initiative to call the low strike this season. This may have taken some teams by surprise as, usually, a pitch is not called a strike at or below the top of the knee cap. However, the league average for called strikes has risen by a percentage point, and the Jays have mirrored this change exactly. The club is not getting burned by the umps. My last theory to explain this drastic increase in strikeouts is that teams are pitching the Jays differently. Maybe they have done some scouting and found something that the team is particularly susceptible to? For example, many of us know that Justin Smoak has exceptional trouble against any pitch that moves, and Pillar has a knack for swinging at sliders in the dirt. Perhaps opposing teams have found a weakness for each player on the roster and have exploited it to perfection. Thus far, the Blue Jays are seeing less fastballs than in 2015 but the rate of sliders, curves and changeups hasn’t changed at all. The heart of the order, Donaldson through to Tulowitzki, can definitely feast on the fastball, which is the main reason the team sees less fastballs than most in the league. The team has already faced knuckleballer Steven Wright twice this season, and the drop in the number of fastballs is directly offset by the number of knuckleballs the Jays hitters have had to face. As a team, it seems that pitchers are approaching the offense no differently than they did last year. Well there you have it, all of the major theories for why a team would strike out more are unfounded. The club is swinging at the same assortment of pitches that they normally do, they’re not being particularly hurt by the umpires’ decisions on called strikes, and the opposing teams’ pitchers aren’t pitching to the team any differently than they did last season. It seems that the Jays are just missing the ball more when they swing at it. The club’s contact rate is unsustainably low, and it will likely climb as the season progresses. As a result, the team won’t continue to strikeout as much. As we’ve seen in their last few games, the Jays are on the edge of breaking out offensively. On Sunday, the Jays had their first double digit hit game of the season, and when this team starts to hit, they are a force to be reckoned with. The hits will come and the strikeouts will scale back. So, no, it shouldn’t be a cause for concern. Another piece of data to consider is the change in the strikeout looking percentage from prior years: 2016 – 28.8%; 2015 – 23.9%; and 2014 – 23.9%. Similar to a calculator, I only offer numbers but provide no explanation. ☺ Perhaps you have some thoughts as to why the Blue Jays are looking at more called third-strikes, expressed in percentage terms, so far this season compared to 2015. Sorry, the 2014 figure should be 23.5%. It’s not binary. The more salient question is the degree to which the increased strikeouts constitute cause for concern. Right now, still being pretty early, it’s fairly low. But there will be more cause for concern if the current level doesn’t drop at a reasonable rate over the next while, and much more if it doesn’t drop at all. Strike outs are way up across the league as well. Obviously more for the Jays than anyone else, but it’s still significant that there has been a dramatic jump from this time last year. I suppose another explanation could be the pitchers the Jays have faced. Just off-hand, it seems that they’ve faced a lot of strike out pitchers. Maybe more than normal. Not that I’ve done the legwork to know that. The increase is probably due to a combination of factors – for instance, more players who have started this season ice cold. Another, I’d guess, is simply that it’s normal for Goins and Tulo to strike out more often than Travis and Reyes, even using Tulo’s career rate rather than his 2016 rate. The impact of Tulo & Goins versus Travis & Reyes is marginal. The 2016 strikeout rate (“SR”) with Tulo & Goins is 26.5%; excluding those two it is 26.4%. The 2015 SR was 18.5%; excluding Travis & Reyes it was 18.9%. The impact depends on which stats you look at and how. For instance, playing in all of the team’s first 14 games this year, Tulo struck out 17 times. Last year, Reyes struck out 5 times. He only played in 11, so if we use his first 14 games instead, he had 7 Ks. That’s a 143% increase, so double the team’s overall 70%. Goins was at 12 Ks after having played in 13 of this year’s first 14 games. Last year, also playing 13 of the first 14, Travis had 7, a 71% increase.